You will note that Table 1 includes data for Nye Clock Oil 140B. This is clock oil used by many restorers and is a good example of a modern clock oil. Note too that the table has data for “Sperm Oil”. This data point was extrapolated from Sperm oil viscosity data found here http://en.wikipedia.org/wiki/Sperm_oil . This data ties compares reasonably well with other Sperm Oil viscosity data I found on the web. The Nye clock oil data came from a Nye specification sheet, the SAE motor oil data is from the SAE specifications for these oils, and the Mobil 1 data are from Mobil 1 data sheets. With this data in mind, let’s recall that what keeps a pivot from metal to metal contact with the pivot hole is the film strength of the lubricant. And that film strength is very important in hydrodynamic lubrication. Or, to state this in a simpler way, increased viscosity results in better lubrication and wear protection. Of course, there is always a “But”. In this case, the but is that increased viscosity also increases the power required to turn a pivot. Or, put another way, given that increased viscosity improves lubrication in a hydrodynamic system, how much viscosity can a clock mechanism handle? Before answering this question I want to comment on the way pivots are finished, and the impact on the way the mechanism runs. In my experience, a month or year duration Vienna Regulator with highly polished “shiny” pivots (pivots polished with 0000 Emory paper), requires 2 to 3 times the power of the same mechanism with burnished pivots. I find this no matter which lubricant I am using. A friend recently commented: “Just because you have an antique clock doesn’t mean you should use antique oil.” Just like in my vintage Jaguar, I lubricate the Vienna Regulator mechanisms I restore with a fully-synthetic 5W-40 motor oil that is very similar to Mobil 1. I happen to use a German oil that I use in our BMW’s, as it was what was in the garage when I started using motor oil. The German oil’s viscosity specs and additive packages are very similar to Mobil 1. I use a fully-synthetic motor oil because these oils are formulated for the most demanding automotive applications – the newest, most efficient motors that demand more from their oil due to their increased operating temperatures. 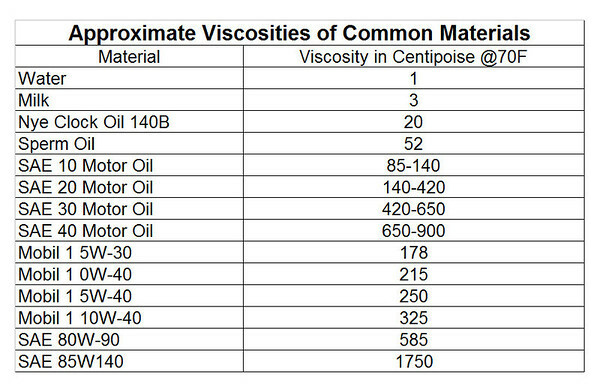 Which means that I am using an oil with a viscosity of around 250 centipoise (cp) at 70F. The only time I use different oil is when the hour strike train spins too freely with 5W-40, such that the gathering pallet strikes the stop on the hour strike rack hard enough that it bounces the pawl out of the rack: The clock just won’t quit striking the hour. I have run into this 4 times with month-duration 3 weight mechanisms. In these cases I use a heavier weight oil, like a SAE 40 motor oil with a viscosity around 700 or 800 cp. To put this more succinctly: I use 5W-40 on years-duration weight driven Vienna Regulator mechanisms – mechanisms that can run for a year with only a 16 pound weight. I also use it on miniatures, with their very short weight drops and weights that weigh less than a pound. I also use 5W-40 on Anniversary clocks, and British long-case clocks, as well as tower clocks. In my experience, the finer Viennese mechanisms require less weight than most other clocks – making them logical test beds for oils that are significantly thicker than conventional clock oil. I use oil with a viscosity that is 5 to 10 times the viscosity (in centipoise) of Nye’s 140B or Sperm oil and the clocks run fine. On the other side of the clock world, what should one use on an American spring-driven mechanism. These mechanisms were designed to run for extended periods and will do so, even if their oil has dried up or solidified. They have very strong mainsprings providing a heck of a lot more motive force than the small weights used in the clocks I work on. Is it likely that the American spring-driven mechanisms would benefit from a heavier oil? A better question perhaps would be “how are the light oils working for you”? Isn’t it logical to say that thicker oils would reduce pivot hole wear?